Disclaimer: Please note that you should do your own research before committing to any piece of equipment for your aquarium. 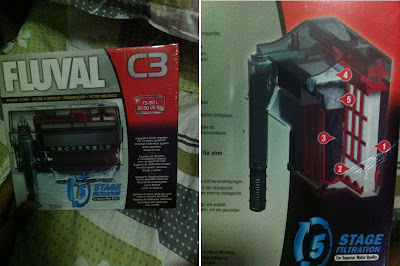 The review is based on my own preference and maybe bias to other equivalent equipments in the market. Late last year, I stumbled upon the C4 Hang On Filter (HOF) online. I had already purchase an Eheim Pro 3 cannister but just wanted something to try out. Below are a couple of reviews that I stumbled upon on YouTube. As my current C4 is being used right now; I'll show the C3 instead; the smaller version of the C4. Fluval HOF C Series comes in three sizes, C2, C3 and the mother of all HOF, the C4. I can't find a C1 on the shelf; not pretty sure if they are being sold. I don't think it is on the market either. Anyway, if you compare the other HOF in the market like Gex and Eheim Liberty, Fluval C series is unique. It's the only HOF in the market that comes with a trickle chamber. The C3 is recommended for tanks between 75L up to 190L and filters about 580L/Hr. When you purchase the HOF, it comes in a square box and is sealed with a plastic. Ensure that it is. These are the items if I remember correctly is what you get. The first thing you'll notice with this HOF is it's sleek design. Its one of the main factors I chose it to be honest. The HOF provides a 5 stage filtration system. 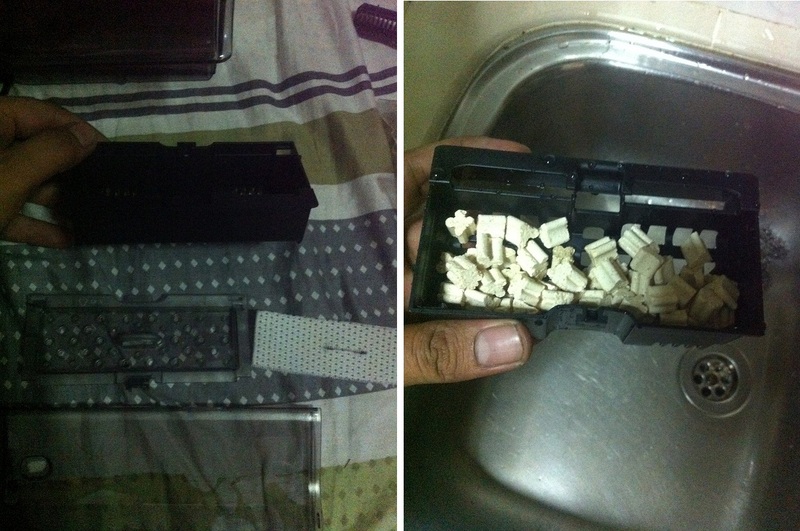 The first and second stages which is Mechanical is the Poly Foam pad. The pad has two sides, one is finer than the other. Though it is not necessary to have it change to the same poly foam provided by Fluval, it is recommeded. It's less than $10 for 3 pieces. Beats having to cut the size of the pad in order for you to fit it in. The slot which houses the pad is easy to remove as it slides out easily for cleaning or changing. There is a clever device on the sides that pops up which tells you its time for cleaning/changing. 3rd stage is Chemical. In this slot is where you have your activated carbon. I didn't put it in though and instead replace it with Biohome media. This slot is great as you can customise and put whatever media you want. I don't use carbon or charcoal on any of my filter. Only use it when I want to remove medication from the tank. It is also use for my hospital tank. So you can put that away and place your own media. 4th stage is the Bio Screen. This is where your Beneficial Bacteria (BB) will colonise. If you bought this filter new, just use it. Once its too dirty, throw away. It's not necessary or a must have item to replace. The filter works fine without it. 5th stage, below the Bio Screen is the trickle chamber. 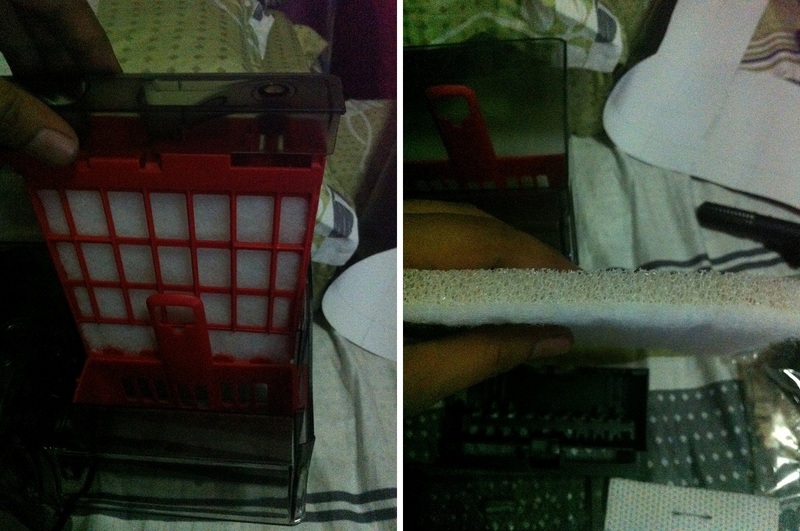 The Bio Screen which not only acts as a place for your BB, it also blocks debris from entering the trickle chamber. The trickle chamber is where you place your C-Nodes. You can of course use your own media. But the C Nodes works just as fine. Don't overfill the chamber. As this will result in the cover to bend. Water will not distribute evenly. You can adjust the hof a little to control its flow. Other than that, I ensure the water level in the tank is just slightly above the lip (where the water comes out) The reason why I do this is that if you have space between the lip to the water level, the water drops and this causes the bottom to stir and you don't want that to happen. It happens to me as I chose the filter which is larger. Say I can use a C2 but instead I go for a C3. It's stronger of course. But the surface agitation is fantastic and I love it. More gas exchange; more oxygen goes in. For planted, you might just need to increase the bps a little. Perhaps by an additional 1 just in case but adjust accordingly to suit YOUR needs. You don't want to kill your fish. 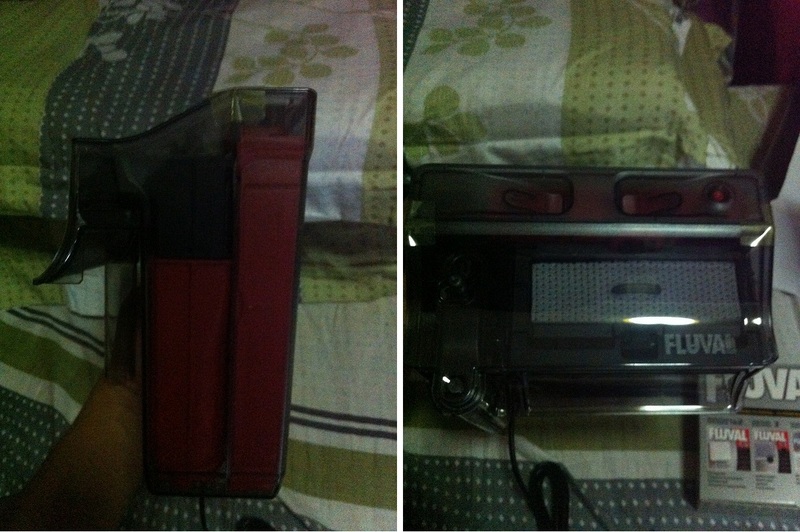 Pros: Unique, sleek, easy to clean, silent, customisable and its the only HOF in the market with a trickle chamber. Cons: Expensive compared to other HOF on the market. Conclusion: I love this filter a lot and I strongly recommend it. 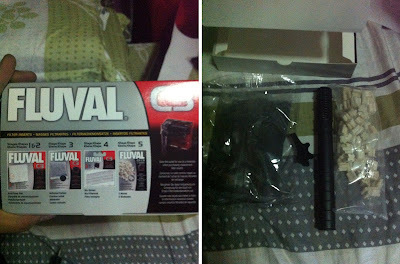 Fluval doesn't have a big market here in Singapore as compared to Eheim so you might run into problems down the years if you need to replace certain things. You can however get the poly pads and bio screen easily. PS: My apologies as I might have missed out some details about this product, if so, please ask and I'll answer base on what I know and my own personal experience on the product. Or you can go to this link which gives a more comprehensive detail of the product. The box the equipment comes in. 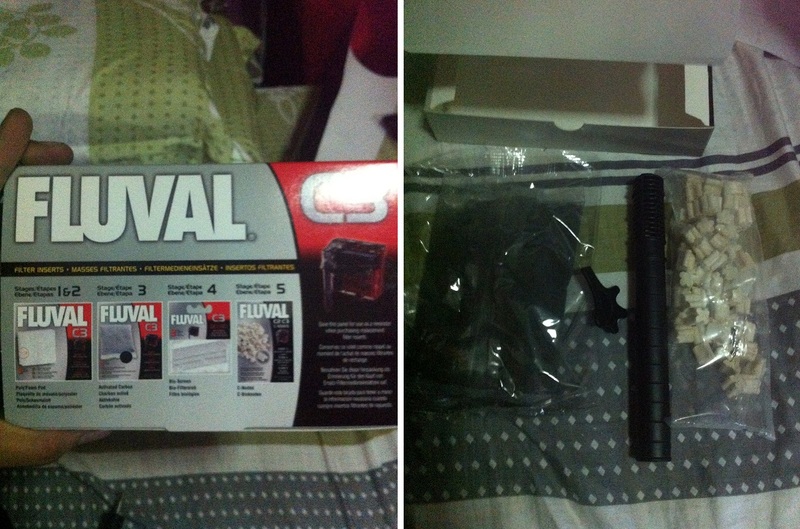 Left Pic: Shows the side of the box showing the items in the filter. Inside the box, you'll find this. the finer part of the pad should be facing you. The chamber where you place your carbon or any other media you like. I placed the water line above the "lip" This causes waves and more surface agitation. 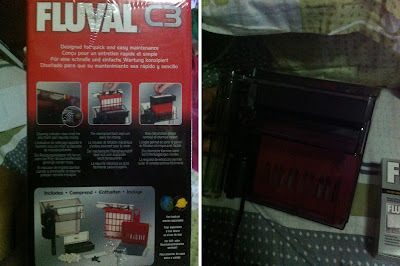 i am planning to buy this fluval c3 filter....could you please tell me the wattage of current.i couldn't find it on the net. 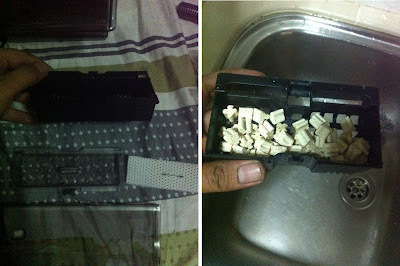 Hi Mazlan, I plan to buy the C3 and the filter pads and the activated carbon. Where do I go? 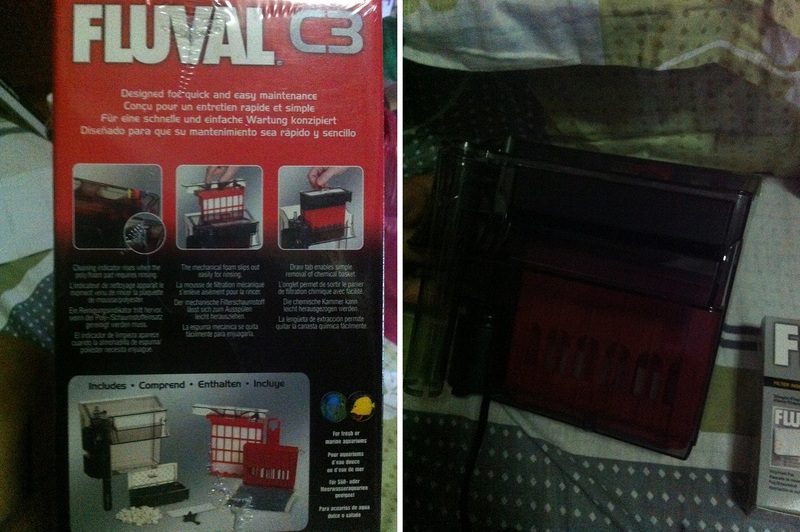 Hi Mazlan, I plan to purchase the C3 and the supplies (activated carbon and the filter pads). Can you tell me where I can get them? thanks. Hi there, I believe you're the same person above right? If you're from Singapore (where I am from), you can go down to C328 @ Clementi and Nature Aquarium (NA) @ Thomson. Other than that you can try online as stated on the left side of my blog. In terms of value for money, go to NA. They have the "accessories" as well.